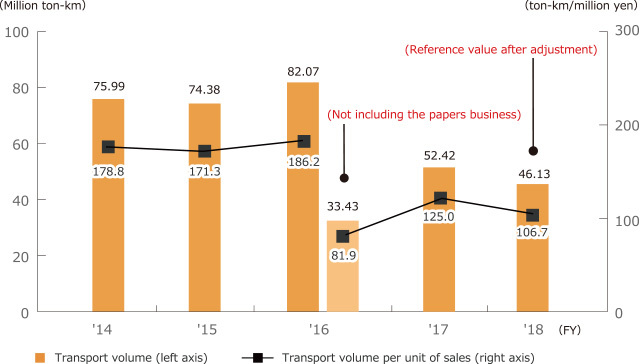 The amount of cargo shipped by the Nisshinbo Group fell to 54.42 million ton-kilometer, down 36% year on year due to the transfer of the papers business. Cargo shipped per unit of sales also dropped to 125.0 ton-kilometer per million yen, down 33%. Excluding the papers business, the amount of cargo shipped grew by 57% and the cargo shipped per unit of sales increased by 53%. This is mostly due to the inclusion of Nanbu Plastics Co., Ltd. in overall totals, which started in fiscal 2017. The automobile brakes business accounted for 33% of overall transport volume due to the transfer of the papers business. Nisshinbo Mechatronics Inc.’s Hamakita Plant has been participating in the Eco-drive (environmentally friendly driving) Promotion Project. This project is based on the city of Hamamatsu’s Global Warming Countermeasures Action Plan and is aimed at promoting the promulgation of businesses establishments that work toward ongoing environmentally-conscious driving. To be certified under this program, a company must be holding Eco-drive training sessions, sharing Eco-drive methods within the company, and conducting consistent management of fuel consumption. The Hamakita Plant continuously displays Eco-drive methods inside of its company-owned vehicles and educates employees about fuel-efficient driving. 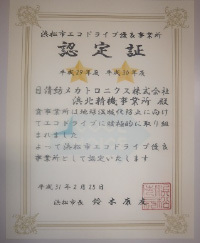 In fiscal 2016, the plant was certified as a City of Hamamatsu Eco-drive Business Establishment and, in fiscal 2017, was certified as a Superior Eco-drive Business Establishment for its Eco-drive initiatives.